I took this picture with an old canon35mm and had it developed on film and disc. I was using a 28mm lens. 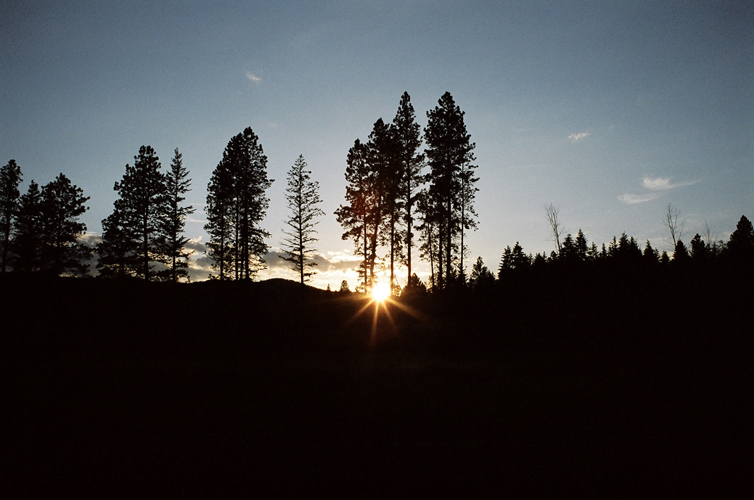 This is my first sunset/landscape picture and I'm pretty new to 35mm phototgraphy. Enjoy! This is my son's shot and the day he took this shot, him and I were on a trek through a trail that he frequently rides on bike with his friends. It was his last shot as he ended up at the end of his roll of film! He forgot to bring more. :sad: But we took turns with my digital SLR. And yes, he's totally new to 35mm photography...he used to use apoint and shoot camera. He recently developed his first 2 rolls of film and it was amazing to see how well he did as he used all manual settings! :-) Needless to say, I was quite proud! I think this is very good for your first attempt at a silhouetted sunset capture!